WANT A DIFFERENT DESSERT? Yes, then keep reading. 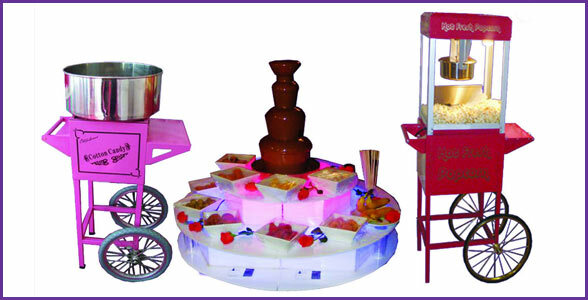 Chocolate fountain hire, popcorn cart hire and candy floss cart hire. Why not add all the “fun of the fair” to your wedding or special event? We offer a range of hire package deals and options with free quotations on request. Our Fully Serviced Chocolate Fountain includes a uniformed operator, 3 hours hire, napkins, plates, skewers, illuminated surround, 11 dipping items and set up & delivery. How about our wonderful, vibrant popcorn cart hire, great fun and a really healthy snack? Choose from salted or sweet for something completely original on your special day. Part of our exclusive package deal. If you wish to hire our popcorn cart alone, please phone for a quotation. Our purely pink candy floss cart hire will provide your guests with all the fun of the fair. Choose from pink, blue or white floss, this goes perfectly with our vibrant popcorn cart. If you wish to have the candy floss on its own please phone for a quotation. Fed up with boring desserts? Want to treat your guests to something a little different and wonderful? Whether your party or event is big or small our package deal will be a big hit. Our gluten free, pure Belgian chocolate is scrummy and will have your guests coming back for more. Our popcorn cart brings in the people. The smell in your venue or home will be amazing and we will have people queueing up in no time. We will make our popcorn plain so your guests can choose sweet or salted. Candy floss, adults will love our candy floss, for most guests they will not have seen or tried candy floss since they were a child. With vibrant colours and a great taste this is a big hit at any wedding or event.